Next post: Even More Food Mysteries For Your Reading Fun! Check out the special discount for our readers at the end of this post. * Russ Robertson, Public Works Director, City of Reedley. John was there not only as the co-owner of Sunnyside Bicycles, but also as the Fresno Cycling Club Advocacy Director, a Fresno County Bicycle Coalition Board Member, and the District 5 representative on the City of Fresno’s Bicycle Pedestrian Advisory Committee. He presented a talk on bicycling as a form of active transportation and how to improve ridership in the Valley. The bicycle truly is a simple solution to some of the world’s most complex problems. The most efficient form of human transportation, the bicycle can help reduce air pollution, combat climate change, ease urban congestion, and build human fitness, wellness, and connection. So how do we get more people to choose to make a few extra trips by bicycle every week? The most obvious answer is obviously to build more bicycle infrastructure. The number one answer we get to the question “Why don’t you ride to work/gym/store/school more often” is the lack of connected bike lanes/trails getting people from Point A to Point B. We need bike lanes/trails that connect to other bike lanes/trails, and we need these bike lanes/trails to connect all parts of the city. If bike lanes/trails are concentrated in one area of town or don’t connect to anything, then it is a bigger challenge for someone to commute by bicycle confidently. 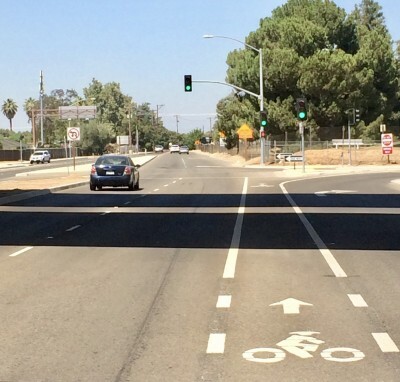 Example of bike lanes that go nowhere, illustrating the need for connectivity. The good news is that based on what I heard from the other panelists speaking, the cities and the planners recognize this. There are lots of projects planned designed to make active transportation easier and safer in the Valley. Dr. Mohammad Alimi shared details about a big project planned for Laton, as well as bike lanes going in on Annadale that will make cycling between Sanger and Reedley safer. Peggy Arnest shared about a Class 1 bike path in Clovis that will have a pedestrian/bike bridge (amongst other things). Scott Mozier talked about the city’s focus on planned sidewalks, as well as the importance of serving all neighborhoods. An exciting project he talked about is the upcoming Midtown Trail, which will be 7 miles and run east/west from central Fresno to Clovis. The bad news is that these projects will take time and money to complete, and some still have the potential to be voted down by Council members who lack the same vision as the planners. This is why the primary message of John’s presentation was that although more infrastructure is critical to increasing ridership the immediate action we, as cities and communities can take, is to dramatically increase our education and awareness efforts. When people say they want bike lanes to get them from Point A to Point B, what they are really saying is that they want to feel safe. We need a Valley-wide campaign designed to educate drivers and cyclists alike, with frequent public service announcements similar to the awesome “Share the Road” video Windsong Productions created for the City of Fresno Public Works Department (in association with the Fresno Bicycle/Pedestrian Advisory Committee). Let’s wrap city buses and line the freeways with billboards, not just reminding people to share the road but teaching drivers how to drive around cyclists and cyclists how to ride around drivers. Let’s promote the Smart Cycling courses taught by Fresno County Bicycle Coalition and share more about what the City PARCS department has been doing in local schools and parks. Let’s get drivers ed classes to include a 15-minute module on what to do when encountering a cyclist on the road, and let’s cite cyclists who break the law but create a diversion program that allows them to avoid fines (similar to traffic school). 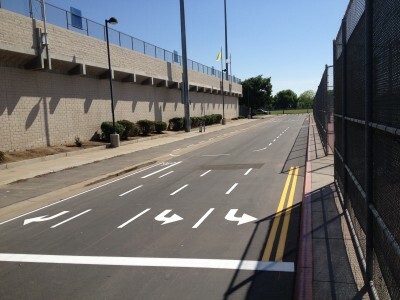 Photo of the bike campus at Sunnyside High School that was built to educate cyclists on how to ride with traffic safely. Bottom line: More bicycle infrastructure is needed, but education and awareness can go a long way towards making bicycling as a form of active transportation more viable for most people. People want to ride their bicycles for transportation. We can all work together to make this happen. •	Russ Robertson spoke about the City of Reedley’s success planning and building the Reedley Parkway Trail. He spoke of how the entire community came together to see it through to completion, from financial donations to volunteer hours to materials donated, and he also spoke of how the trail connects residents from various parts of town to each other. It is possible to ride the trail to school, the gym, shopping, restaurants – in other words, it provides the connectivity so many people ask for. 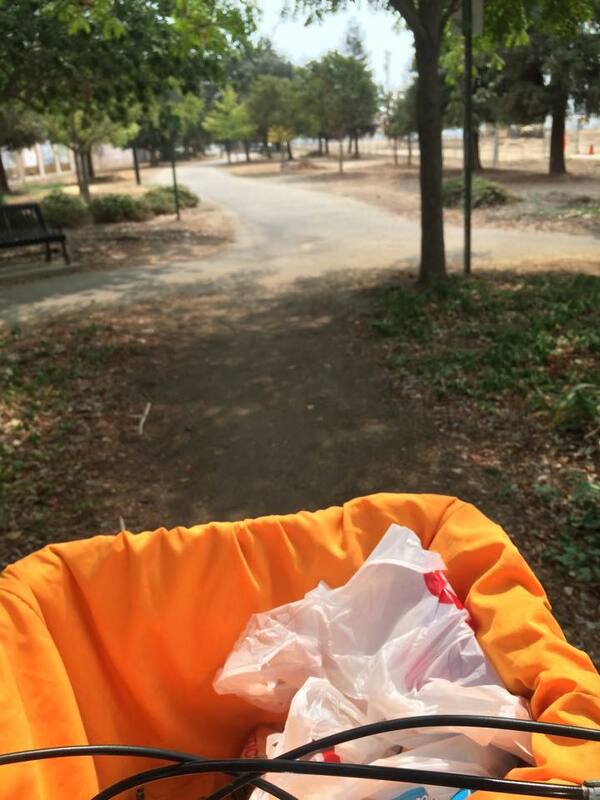 It served as a great example of a city working with its community to make something happen. 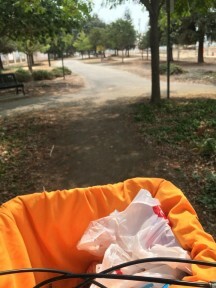 Me running errands by bike utilizing the River Parkway Trail in Reedley. •	Peggy Arnest spoke of several projects that have been planned but reminded us all that they cost money. She reiterated the need for the revenue from SB-1 (gas tax) to help fund the projects, and reminded me of the need to shop local in order to help the County collect my Measure C sales tax money to help fund road and transportation improvements. I’ve since consciously made an effort to shift more of my purchases from online to local. •	I left the panel discussion full of hope and excited about the future for active transportation. It was clear to me that more people than I realized share our vision for a healthier Valley with cleaner air, and it highlighted the importance of being vocal and active proponents for bicycling and bicycle infrastructure. We need to be sure our voices are heard! For more information on the Fresno County Bicycle Coalition, visit fresnobike.org. To watch Smart Cycling videos, visit the League of American Bicyclists here. Mention this Kings River Life Magazine article for 20% off any light set to help keep you safe on your next commute! Expires April 30, 2018.